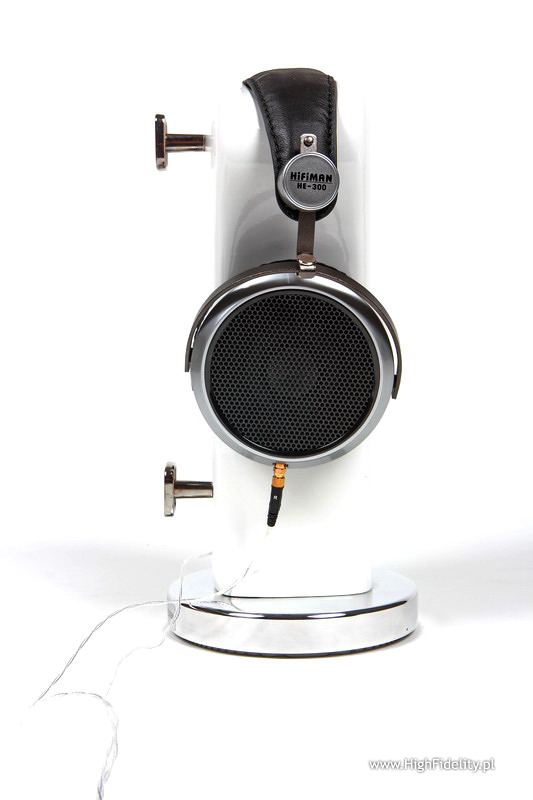 HE-300 are the only full-size dynamic headphones offered by an American company HiFiMAN. Founded in 2007 by Mr. Fang Bian it has direct ties with China, the country of his ancestors where its products are manufactured and some of them, e.g. headphones, are also designed. The person responsible for the latter is Mr. He whose name features in every model type of full-size headphones. 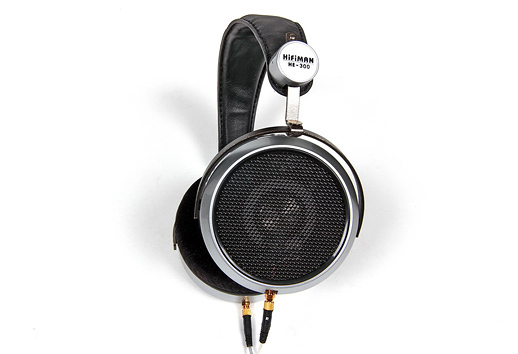 The company was founded with one goal on Mr. Bian’s mind - manufacturing and selling the best possible and the most affordable magnetostatic headphones (also called planar or orthodynamic). The HE-300 is an exception to this rule being dynamic headphones, the least expensive in the whole line. It would be a mistake, however, to pass them over only because they lack flat diaphragms with sputtered flat voice coil vibrating between magnetic assemblies on both sides of the diaphragm. 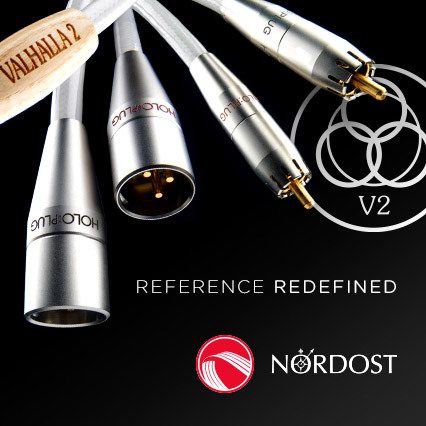 Their outer design, the cable, and even the drivers are of the highest quality. Everything, besides drivers, looks almost identical to the more expensive models. Large earcups, metal bridge, high-quality cable (fully replaceable), velour earpads, tight clamp on the head. Of course, there are some differences – the cups are made of silver plastic (the cups color is a distinguishing feature between various models), and the leather-clad padded bridge is not particularly refined nor is the leather genuine. Nevertheless, it would be a shame not to try out that second last model from the manufacturer (I haven’t had a chance yet the listen to the newest HE-400). All the more so as two of the other models I’ve tested, the HE-500 and the HE-6, stayed with me as reference headphones. I compared the HE-300 primarily against my reference Sennheiser HD-800 as well as the magnetostatic HiFiMAN HE-500. It didn’t take me a long listen to conclude that the HE-300s are much different from both. They are the first headphones from that company that seem to sound “warm”. I put quotation marks here because that’s not fully true and is probably an oversimplification; however, that’s how they sound initially. Still, it needs to be noted that that’s how they were described and commented on both by Mike, the editor of “Headfonia”, and Brent Butterworth in his review for “Sound + Vision”. We will come back to that later. The main thing to be said is that the reviewed headphones deliver strong, very rhythmic bass. All sounds in the bottom range are slightly emphasized and “picked up”, i.e. not so much inflated but somehow “noted” and “appreciated”, which is not the same as a simple bass emphasis. Strong performance just below 100 Hz and above 42 Hz, the base frequency for the double bass, is evident and has been confirmed by “Sound + Vision” measurements demonstrating that the headphones maximum impedance (up to 94 Ω) occurs at 68 Hz resulting in a 2.4 dB increase in the frequency response. That’s something beyond discussion. That gives an excellent foundation to the rest of the frequency range. Putting the HE-300s on the head we are immediately isolated from the surroundings. Isolation is fantastic for an open design, almost as good as with the closed headphones, and we are immediately “immersed” in the sound. It is a deep, substantial and dense. And it’s primarily that “density” that makes us perceive the sound as “warm”. Besides, treble is rather withdrawn which only strengthens that impression. But, let me repeat, that is not a “warm” sound per se. The reason for that is that upper midrange is quite strong. Not so much the whole band as rather its narrow section but it can be heard as a slight hardening of some higher vocal parts and other instruments, such as the trumpet. Just to be clear, that strengthening is not unpleasant. It’s not brightness, grain or impurity. I’d say it’s something like a stronger accent. With that kind of accent or emphasis within that frequency zone there can be no question of “warmth”. Let’s go back to the beginning then. 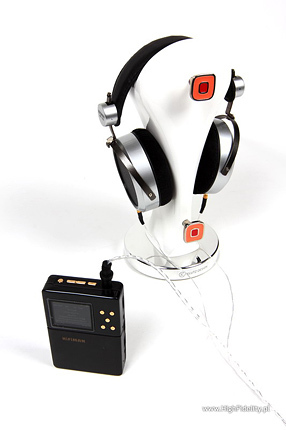 Strong bass and very high culture of sound meant that for over a month before formal auditions I’d been listening to the headphones paired with the HiFiMAN HM-801 portable player. In my opinion it’s probably the best player of that type currently available. With the HE-300 it makes a lovely pair indeed. The sound from this duo was dense and strong. With classical music the uniform emphasis of the said narrow bass range was slightly distracting but after getting used to it I had no other objections. Actually, it just so happened that on that system I preferred to listen to more rhythmic recordings, to electronics and rock rather than jazz or classical music. These headphones are, in my opinion, perfectly suited to generating low, really low sounds, to a slightly closed headstage, to close-up presentation rich in massive bass. Feet were dancing away, hands were clapping the rhythm when I listened to remixes on the limited edition of the album Bruise by Assemblage 23. Rain Falls Down that’s not available on the “regular” release resonated with power in a dark, disturbing way, hiding some secret. The same was true with remixes of Enjoy The Silence… 04 by Depeche Mode from their single by the same name. Both the strong, hypnotic “Richard X Extended Mix” remix of the song, and – an even better – “Cicada Mix” remix of World In My Eyes were shown fantastic by the HE-300. I had no doubt that they are just the right headphones for that kind of music. I sat down and listened, listened and sat down – you just need to experience that yourself! However, for proper auditions I paired the HE-300 with my reference headphone amplifier – the Leben CS-300XS [Custom Version] and a brilliant amplifier built into the Marantz SA-11S3 SACD player. The latter completely surprised me. I have just reviewed a Marantz system with the said player and the PM-11S3 amplifier for Polish “Audio” and I treated the headphone output in the “Player” as an add-on, the same as it’s almost always treated by manufacturers. I was proved wrong. In this case the developers approached the matter very seriously and in addition to a normal line output they included another, almost identical output stage dedicated for the headphones, built around a few HDAM S3modules and discrete power transistors. That makes the unit a high performance headphone amplifier integrated with an SACD player and a DAC as the Marantz sports a digital input. Both amplifiers instantly showed why the Sennheisers HD-800 are much more expensive. There was no doubt they build bigger, better arranged virtual sources, provide better tonal balance and most of all have better resolution. Despite that, I spent most of my time with the Leben and the Marantz paired with the HE-300 on my head. Why? Because it’s good playing. Not quite “audiophile” in the sense that one hears what was done and why and that the main concern was certainly not fidelity to the recording material but loyalty to a vision. After all, maybe THAT is audiophilism… Be that as it may, with the kind of music material I mentioned it was great. There was meat, weight, dynamics, good selectivity, no sharpening. And I think it probably sounded even better with the Marantz. It seems that all the headphones need is simply a headphone amplifier with a slightly lighter tonal balance and everything returns to normal, at least when it comes to bass volume. I’ve known of the ph25.2 for a long time. Preparing for the reviews of Music Hall turntables and D/A converters, especially the dac25.2 and dac25.3, I also read about that headphone amplifier.